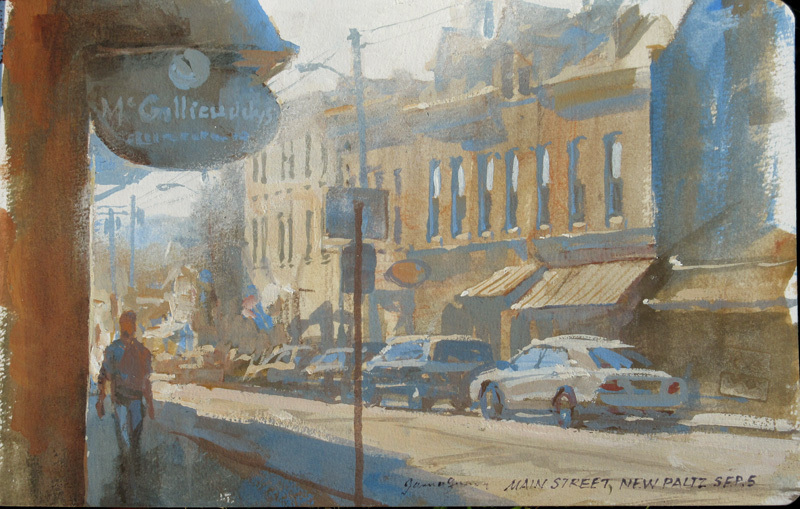 Yesterday I painted this study of Main Street in New Paltz, New York. I used casein with a limited palette of cobalt blue, yellow ochre, light red, and white. I kept the sky nearly white and flooded cool skylight across the small forms that crossed into the sky. The rest of the scene explores contrasts of warm and cool at a fairly high key. Jeanette and I set up at standing height on the sidewalk beside our friend Garin Baker. We kept to the shadow side of the street to avoid working in the glaring sunlight. Beautiful - even with the cool colors, it reads as warm to me, which is what I like. What an effective painting. Like Susan, I can feel the air and see the light as if I'm standing there. This is a great example of how (palette-wise) less is often more. Beautiful! ... I still have so much to learn. Another great example, along with the Outdoor Market Contest entries, of how a limited palette can really aid in producing "harmonious" results. 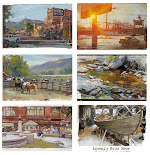 I'm heading back to paint Southern Utah again next year and these examples have inspired me to deviate from my standard limited palette of blue, yellow and red and try some color combinations that I think will really accentuate that spectacular landscape. Beautiful painting. New Paltz never looked so good! You were smart to pick the shady side of the street. Whoa, no white?! Geez, thats really cool! I may have to try a painting one day with with the same hues found in most printers, it should prove to be a wonderful lesson in color theory. Or maybe the Zorn palette I hear so much about, anyway, great painting as always, thank you for keeping me inspired. Chris, sorry for the confusion. Yes, I used white along with the other three colors. Other than white I used the other three rather dull versions of blue, red, and yellow, and focused mainly on value and warm and cool. Thanks, Rosemary! Lou, I was inspired by the Outdoor Market entries to try another limited palette. Fun to have those limitations. Well done! I can feel the summer heat. When choosing primaries or triads ,do the surroundings inspire you in the way that you try to match the red ,blue and yellow as close to the present lights available? 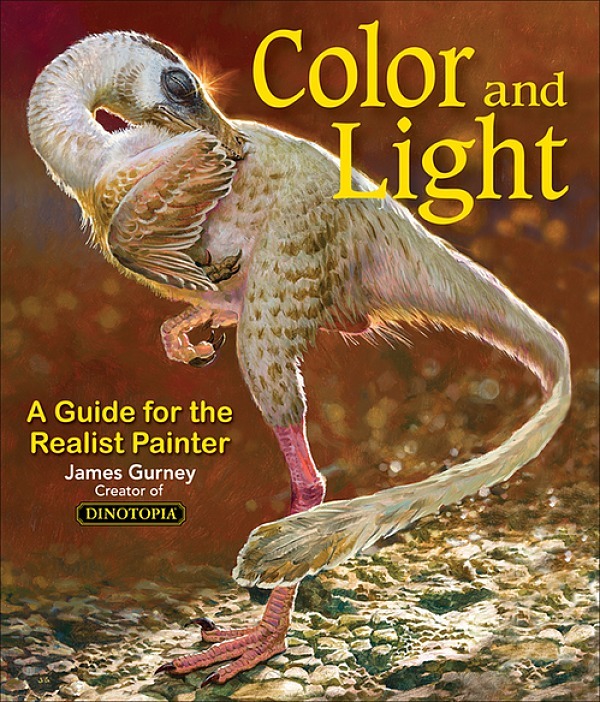 Let´s say: You see a glare and you choose a yellow that would get relatively bright with white (cad yellow vs. yellow ochre)? Gyrus, I was originally just going to paint this in black and white monochrome, but then decided to bring in a bit of warm and cool. The palette I used is a good one for that, and you can still stay well within that gamut. Thanks for the clarification Mr Gurney. One day I will attempt a painting with similar hues. James, forgive me if you've mentioned this in another post ( i've searched your blog but have not found ), but I was wondering when you plan to release "Casein in the Wild"? Also, I know you've attended at the Plein Air conference before and was wondering if you will be attending the 2016 in Tucson? Thanks, mate. And have a good day. Thank you again for all of your knowledge and inspiration. Unknown, I've got everything shot and ready to go--in fact, I've got more than enough material for the casein video. To answer your question, I hope to release it by the end of the year. I'm afraid I'm booked up with other conventions, and won't be able to attend the Plein Air conference. Instead I'll be at the Portrait Society conference and the Spectrum Live convention in 2016.